Electrical pitting damage, caused by intermediate arcing between stationary and rotating machine components, erodes the babbitted surface of a bearing, causing it to fail. With the right precautions, however, this type of damage can be prevented. In this example of a steam turbine application, the consequences of erratic thrust pad temperatures were not obvious until the bearing was removed from the machine. In this case, the normal pad temperature was 95°C for a 10½", 6 x 6 LEG thrust bearing operating at 5700 RPM. The pad temperatures had been rising steadily for several days when suddenly the temperature of one pad shot up to 118°C and the other to 103°C. A few days later, the pad temperatures dropped back to 111°C and 92°C. 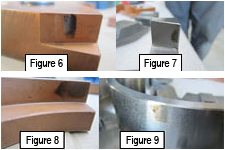 When the bearing was removed from the machine, all the thrust pads showed some signs of distress, as shown in Figure 1. In Figure 2, the original babbitt is only present at the leading edge of the shoe. Evidence of a wipe can be seen toward the outer edge of the shoe. The areas at the trailing edge of the shoe and toward the inner diameter at the leading edge have clusters of small pitted marks. There is a significant loss of babbitt toward the shoe's trailing edge, shown in Figure 3. Figure 4 shows a closer view of the pitted marks. Note how they appear frosted. The babbitt is nearly gone at the trailing edge of the shoe as shown in Figure 5. Figures 6 & 7 show signs of burned oil in the contact area between the straddle mill of the shoe and base ring. Figures 8 & 9 show signs of burnt oil in the contact area between the shoe's inner diameter and base ring. The small pit marks and frosting on the shoes are classic examples of electrical pitting damage. This is caused by intermediate arcing between the stationary and rotating machine components. The electrical current travels through the path of least resistance, which is typically through the smaller oil films in the active or loaded thrust bearing. The pitting damage starts at the trailing edge of the shoe where the film thicknesses are the smallest. As the babbitt is removed by the electrical currents, the tilt of the shoe changes until the load carrying area of the shoe is reduced. The damage gradually progresses towards the leading edge of the shoe. Eventually the bearing will not be able to support a load and will wipe. Recommendations to prevent this type of damage: Install grounding (or earthing) brushes on the rotor or by insulating the bearings. The source of the current should also be investigated.